Our Hacienda Heights car accident lawyers and law firm provide expert personal injury legal services for those injured in auto, motorcycle and other accidents, and for the relatives and families of those killed in car and other accidents for wrongful death claims, in Hacienda Heights, California, a community of 54,038 people, located in Los Angeles County, California. If you had a car accident or other personal injury claim in Hacienda Heights, Los Angeles or anywhere else in California, please contact our injury attorneys and legal team now for a completely FREE CONSULTATION. Hacienda has an area of about 11.2 square miles and the community borders La Puente, West Covina, Whittier, La Habra Heights and Rowland Heights. Obtain and keep the following in your car or other motor vehicle: Cell telephone, paper and pen or pencil, camera to photograph all involved vehicles, people and scene (mobile telephones usually include a camera), flashlight and first aid kit and other emergency gear such as cones and flares. Check everyone involved for any injuries and if anyone needs urgent medical care call 911 for assistance. If the accident is not your fault, we strongly urge you to call the police and obtain a police report (Traffic Collision Report) to confirm same. When appropriate, move all vehicles to a safe position or area and do not place yourself in any danger. Turn on the vehicles' hazard flashers and use other warning devices, such as cones, if available and if safely can be displayed. A Hacienda Heights car accident can be a tragic and traumatizing event that can result in a catastrophic outcome for the victims so it is especially important for those that experienced such an unfortunate injury accident to have an experienced car accident lawyer on their side. We have been recognized as PERSONAL INJURY LAW FIRM OF YEAR 2011 due to our more than 40 years of success in resolving thousands and thousands of car accident and other personal injury cases in Hacienda Heights and throughout California;and two of our attorneys, Robert Walch and Gary Walch, were each selected as Top Lawyers in California (Highest in Ethical Standards & Professional Excellence). Our aggressive but compassionate attorneys and staff work tirelessly and exceptionally hard to make the claims process as simple as possible for our clients, the victims and their families. 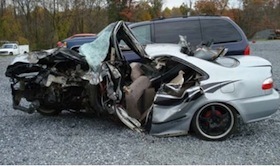 You will find a great amount of additional helpful information by visiting our new and updated Car Accident Web Site. During the past 40 years, The Walch Law Corporation has not only effectively recovered more than $100,000,000.00 in funds for its clients, but also offers the victims of car accidents FREE consultations and direct help with medical care (regularly without any payment until the case is resolved), specialists, property damage repair and settlement. You can find out what our clients have to say about us on our Car Accident Testimonial Pages simply by clicking here. One serious injury that victims of car & motorcycle accidents experience is a fracture. A bone fracture is a painful medical state in which a bone is cracked or broken. A large amount of fractures are a result from high energy impact or unanticipated jolts that occur in car, motorcycle, truck, bicycle, pedestrian and fall accidents. Broken bones are painful and can cause a great deal of physical and emotional distress for the victims. There are numerous types of broken bones that each has its own unique characteristics. A closed fracture is a break in the bone that does not pierce the skin while an open or compound fracture involves bones that have broken through the skin which may expose the bone to contamination and infection. Open fractures carry a higher risk of infection, require antibiotics and usually surgical treatment to, among other things, remove dirt and contamination. If you or someone you care about experienced any bone fracture from any car accident or other personal injury accident in Hacienda Heights or anywhere in California, please speak with one of our attorneys as soon as possible. We are also able to refer you to doctors, including orthopedic surgeons, who may provide care and treatment without requiring payment until the claim is resolved. The Law Offices of Gary K. Walch provides you the quick support and the strong advocacy that you need when you or a loved one has been through a destructive car accident or other personal injury accident in Hacienda Heights, Los Angeles or anywhere in California. Our job is to stand-up for your interests while we personally make it our obligation to protect your rights to the highest standard possible. Our staff handles serious injury accidents involving car, motorcycle, truck, bus, train, bicycle, pedestrian, hit and run, uninsured motorist (UM) and much more. Call us for an absolutely FREE consultation to review and analyze your car accident or other personal injury case. For your convenience you don’t even need to leave the comfort of your own home. Just like many of our clients you can do everything by telephone at 818-222-3400 or toll free 866 INJURY 2 (465879 2), email (info@WalchLaw.com) or simply complete our very easy to use contact form.